The more altruistic amongst us often dream of changing others’ lives for the better – of serving and succeeding, of alleviating people’s suffering. As is to be expected, many of them sign up for programmes like the International Service Learning Elective, more commonly abbreviated as ISLE. In this highly sought-after enrichment programme, teams of students are tasked with planning and executing a service learning project in a South-East Asian developing country. Despite the significant cuts in the programme’s intake (only one team will be heading over this year), it is still a good time for us to reflect on some of the questions that have been plaguing development aid as of late, specifically in the context of ISLE. Numerous articles critical of international service have been published in recent months, and our home-grown enrichment programme has brought similar doubts to the forefront. For one, who winds up benefitting more – the servers, or the served? More importantly, is the latter inadvertently harmed by the efforts of the former? Last year, ISLE spent about 6 months fervently making preparations for their community service efforts. Yet, their efforts notwithstanding, the various ISLE groups ended up facing several profound issues that likely caused the effectiveness of their respective projects to fall short of idealized expectations. Here’s a brief summary of what happened. The members behind ISLE Riverkids had decided to educate students in Phnom Penh, Cambodia, on topics like hygiene, ambition and marketing. To accommodate their request, the teachers hired by Riverkids, the NGO overseeing volunteering projects for that community, had their lesson plans for arguably more pertinent subjects like Math and English substantially disrupted, according to a member of the ISLE team. “There was a language barrier … we’re less efficient than the teachers,” he admitted, while also highlighting the need for continuity in the curriculum, which the ISLE students’ intervention lamentably compromised. The problem wasn’t specific to Riverkids, too – those at ISLE Rainwater and ISLE Laos faced a nearly identical situation. “We had exactly 2 lesson plans for the kids (from Preak Kuy Commune, Cambodia), which we could just have asked the teachers to conduct … we might have caused more hassle with all the translators,” said a student involved in Rainwater’s project. A student from ISLE Laos echoed this sentiment, saying that their lack of a translator made language teaching “extremely difficult”. Moreover, the Riverkids group was forced to alter and improvise many lesson plans due to a dearth of information, which may have affected the quality of their teaching efforts. We are often taught that education is a sort of panacea for the poor – one that breaks people out of the grim clutches of the poverty cycle and helps them haul themselves up the long and tortuous social ladder. It is thus rather understandable that volunteers would feel optimistic and assured about the idea of imparting some of their knowledge to their charges. Education does have the potential to transform lives, but this is only true if it is delivered in an appropriate manner by suitable, experienced people. Evidently, the ‘assistance’ rendered by these eager students might not have been the most ideal course of action for their target communities; in fact, some small amount of harm might have been wrought. 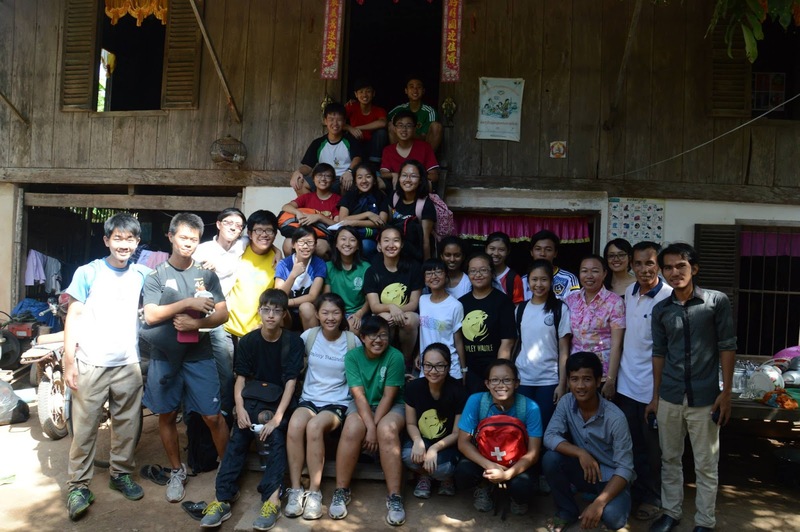 Of course, the Rafflesian volunteers didn’t just conduct lessons – they also carried out various other projects aimed at ameliorating the standard of living in their target groups. Some good news: an ISLE Riverkids member felt that the data they collected through their survey was useful for Riverkids, meaning that their trip was valuable to an extent. Regrettably, though, a problem akin to the aforementioned ones emerged when ISLE Rainwater was carrying out their project. The group had lent their labour to the construction of eight “Jumbo Jars”, which were large-capacity water storage tanks; a team member recounted how the engineers in the area could have readily built the water collection jars by themselves. A member from ISLE Laos, which helped to build water collection points and wells, similarly realised that “the locals could definitely build (the water collection points and wells) faster than us”. Owing to their relative inexperience, their contributions may have been somewhat redundant, and it is possible that their limited time could have been spent on more productive service-learning activities instead. Perhaps it would have been more effective for the volunteers to have simply raised funds for the NGOs already involved. According to an ISLE Laos member, his group was effective in that their fundraising efforts were instrumental to the implementation of their construction project. Simply preparing speeches and posters meant to cajole our fellow schoolmates into opening their wallets for charitable ends may feel somewhat inadequate, especially when compared to the back-breaking labour hands-on construction projects often necessitate. When you are getting your hands dirty and your fingers worked to the bone, you are more likely to feel as if you are making a real sacrifice, and that this entails a greater contribution. That very misperception disregards the fact that funding can make a sizable difference, one that may even be greater in magnitude than the positive changes brought about by alternative measures. Sometimes, no matter how much one wants do something, one may have to acknowledge that it is best to leave the job in the hands of a more competent party. These facts also cast doubt on the oft-held assumption that direct service is the most meaningful form of service. It is quite hard to argue that this statement holds true when it comes to the server’s character development, but shouldn’t aid be about addressing the needs of the beneficiaries instead? Would that not be more meaningful from an altruist’s perspective? The short amount of time the groups spent there (i.e. a week or two) compounded the already limited extent of the contributions they could make for their beneficiaries. “With two weeks, there’s really nothing much you can do to make a difference,” reflected an ISLE Riverkids member. For ISLE Laos, the fact that their trip had to be cut short (as a majority of their team unexpectedly fell ill) couldn’t have helped either. A lack of prior interaction with their respective communities could also have hampered the students’ project organization efforts, as they did not have a thorough understanding of the various cultural nuances present amongst the locals. As schedule-packed JC students, our capacity for dedicated long-term service overseas is suspect, which makes me wonder if international service is really something we should be doing at this stage of our lives. Although the associated problems could conceivably be mitigated through close collaboration with the long-standing NGOs in charge of the area, in the case of ISLE Riverkids, for one, liaisons between the students and Riverkids were apparently neither extensive nor effective. It is hard to deny that most of the participating Rafflesians were well-intentioned, generally had the will to invest considerable time in their projects, and harbored a strong desire to serve, but good intentions are hardly a guarantor of success. It is not inconceivable that volunteers may neglect to truly take the needs of their beneficiaries into consideration, particularly if they are novices at both international service and serving the particular beneficiaries involved. From the above anecdotes, it appears that this has partly been the case. “Not much thought was put into whether we were actually really meeting the needs of the community, even though it was always emphasized how important it was to accurately identify and address their needs … there wasn’t a need for us to help out in most cases,” an ISLE Rainwater member candidly shared. However, it must be conceded that the Riverkids NGO had prepared a rough programme outline for their ISLE team, and that the latter may thus not be fully liable for the ostensible ineffectiveness of their programmes. This does not mean the programmes were noticeably beneficial to the community, as the Riverkids NGO was primarily banking on the hope that the Rafflesians would return another day to serve the villagers again. Though the ISLE Laos team did strive to do a comprehensive needs assessment, factors like time constraints and a weak grasp of the political, cultural and social issues within Laos hindered their efforts. Once again, the substantial hurdles inextricably linked to short-term service are called to mind. Such obstacles are all the more worrying when we consider the pedestal that we often put ISLE up on, as it is invariably one of the most popular enrichment programmes when applications open in February. To cite an issue of concern, some ISLE Rainwater participants believe an excessive amount of time was allocated to the “learning” component of service learning, as there was reportedly a preponderance of sessions getting members to reflect on their personal gains from the programme. While the importance of such activities must be acknowledged, as the ISLE is supposed to concurrently serve as an enrichment programme, it seems callously ironic that our school’s comparatively privileged students were given so much time to benefit through introspection – all at the expense of time that could have been used to design programmes that actually yielded fruits for their penniless counterparts overseas. Both Rafflesians and their target groups could potentially gain more if those behind ISLE replace some of the extraneous ‘reflection time’ with more productive project planning activities, or make more ‘reflection time’ dedicated to pinpointing flaws in the projects before they have been executed and not after the fact. Points do have to be given to ISLE Rainwater for attempting to tailor their teaching curriculum to better fit their charges’ needs (relative to the programme conducted by the previous batch, that is), but a member still opined that only slight modifications were made and that more radical alterations were required for the project to have been effective. Nevertheless, an ISLE Laos member highlighted that the reason why they worked with the same community as previous batches was to achieve greater sustainability (a partial substitute for long-term service, perhaps? ), and that may be something to be commended. It can be granted that the decision to focus more on the students’ personal growth may be borne out of generosity, as the self-awareness acquired by ISLE participants from such sessions may plausibly enable them to refrain from mistakes that they committed in the programme in their future volunteering efforts. A deeper contemplation of the lives led by the destitute may also endow them with a greater empathy for – and motivation to help – the less fortunate. “The most valuable thing about the experience is how it transforms the students involved, setting off a chain of events just like a ripple effect. Every transformed ISLE member is hoped to be able to apply the lessons of the failures they have [experienced in their] future work,” said an ISLE Laos member. Even the Riverkids NGO seems to have agreed with this principle, judging by their choice of service programmes for the student volunteers. The most experienced of volunteers must have started from somewhere, after all, and that start might not have been a smooth one – from certain perspectives, a rough beginning may even be more ideal in the long run. It is a fine aim for the ISLE groups to minimize the number of mistakes made during their trips, but a more critical goal may be to ensure as far as possible that succeeding batches of volunteers and they themselves manage to circumvent these oversights in future projects. Despite the inevitable constraints that come with this form of short-term service, I still hold the opinion that ISLE has the promise to be much more than it was last year, especially with sounder planning, more comprehensive guidance for incoming members and some restructuring of the programme’s activities. Hopefully, these changes will help allay some of the concerns highlighted above; rumours that some improvements are already in the pipeline certainly serve as a source of optimism. It will be quite tragic if the “service” we provide ends up only benefitting the ones providing it; I am certain that’s not what most of us are looking to achieve when we’re carrying out or sponsoring international service.